Background: Liposomal doxorubicin is widely used for treating ovarian cancer and Kaposi’s sarcoma. Encapsulation of doxorubicin in highly complex polyethylene glycol–coated (stealth) liposomes prolongs residence time and avoids the systemic toxicity associated with administration of the free drug. Small variations in physicochemical properties introduced during manufacture of liposomes can influence the payload of encapsulated drug, stability of liposomes under physiological conditions, and release of drug at the target tissue. 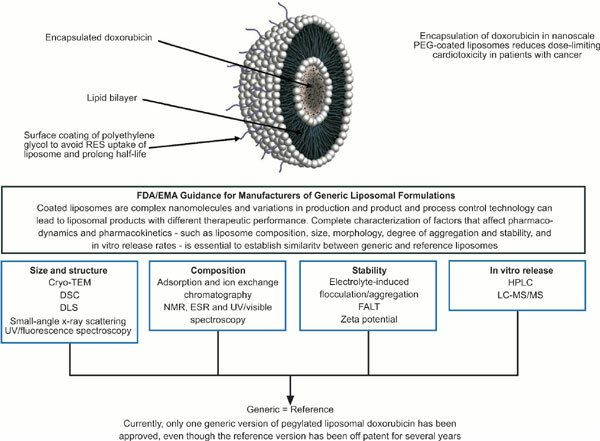 Accordingly, the US Food and Drug Administration and the European Medicines Agency have issued guidance for manufacturers of generic liposomal doxorubicin that is designed to ensure that more than 30 physicochemical parameters that influence its safety and efficacy should be similar in the generic and reference listed drugs. Objective: This study aims to describe the physicochemical characterization procedures used to ensure consistency between batches of generic liposomal doxorubicin and with the reference listed drug. Methods: A range of spectroscopic, chromatographic, and other physicochemical tests was used to compare relative concentrations of liposome components, liposome morphology, ratios of free/entrapped doxorubicin, stability, and in vitro doxorubicin release rates in physiologically and clinically relevant media. Results: The tests established that generic and reference liposomes contained similar concentrations of drug, lipids, and excipients and that their physical forms were also similar. Conclusion: The results of the tests demonstrate the physicochemical equivalence of generic liposomal doxorubicin hydrochloride and the reference listed drug, Doxil®/Caelyx®. Biochemical and clinical equivalence must also be demonstrated to fully meet regulatory requirements for generic liposomal medicines, and these are the subjects of separate studies. Doxorubicin hydrochloride, liposome, sterically stable, generic, physicochemical equivalence, cancer.